There are many reasons to get a new US passport, an internationally recognized document that verifies the holder's identity as a United States citizen. First among reasons to get a passport is to travel overseas. Most nations require that you carry a valid passport for entry into their country and the US requires you have one in order to return to this country. 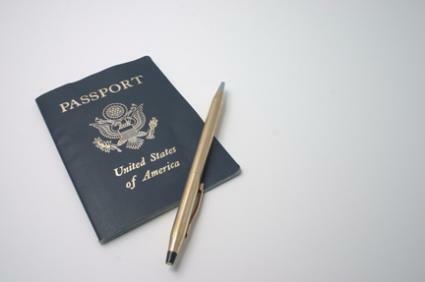 Other countries, including many Caribbean nations and Mexico, who have traditionally only required US citizens to carry "proof of citizenship" are now starting to require a passport instead. A passport is also the best form of ID available. A US passport is a 3"x 4" document. Most citizens have blue passports. Military personnel and diplomats have red ones. The inside of this document has the bearer's picture, personal information, emergency contact information, and a dozen of so blank pages for visas. Do I Need to Get a New US Passport? All US citizens who have never had a passport must make an in-person application for a new passport. In addition, you'll need to get a new US passport if your old passport expired more than 15 years ago, you've lost your old passport, or if your old passport was issued when you were under 16 years of age. Applications for a new US passport are taken at more than 7000 passport acceptance facilities scattered throughout the United States. Most of these are post offices, but they also include passport agencies, courts, and libraries. To find a location near you, check the blue pages of your telephone book or visit the passport information website. The passport agent will ask you a couple of questions, ask you to verify that you are who you say you are, seal all of your documentation in an envelope, and have you sign across the seal to avoid the information being tampered with. New passport applications take between two and three weeks to execute and the new document as well as your application documentation will be returned to you via US mail. Passports are valid for ten years. For very last minute cases, a plethora of companies exist who will hand carry your information to the appropriate agencies and request rush processing. New applicants will still have to apply at a passport acceptance facility, but instead of leaving the signed envelope with the agent, one should request to "hand carry" the application packet. A passport expediter only makes sense for those who live outside of the cities that have a passport agency or for those who don't have time to go to the agency themselves. Fees for this service are generally rather expensive.